We all have childhood favorite meals; mine just happens to me Makloubeh specifically with eggplant and potatoes. It wasn’t until today making it with my mom did I realize how many steps it requires. It is all worth it though! 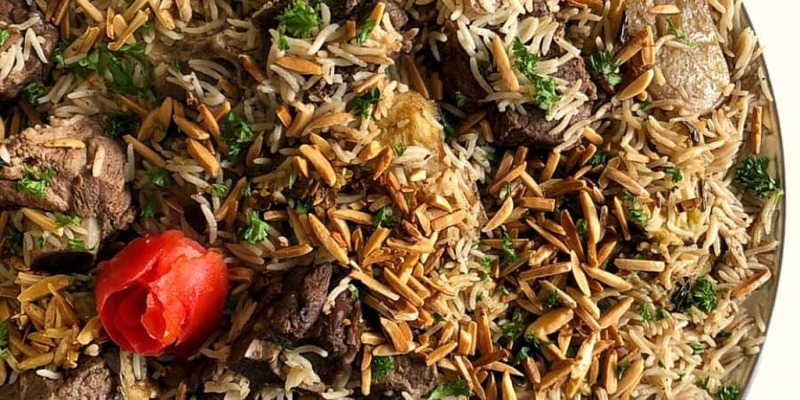 This Middle Eastern rice dish known for flipping upside down and sometimes maintaining its shape is a very popular traditional meal. Often we enjoy it with a fresh salad and some plain yogurt which balances the warm spices used in making this dish. To see how it was made; my mom and I went through the steps on Instagram. The video will be saved in my highlights. I hope you make it this sometime and enjoy it with your family and friends. Wash the lamb pieces with cold water thoroughly. Add the meat to a large pot and cover it with water. Let this come to a boil. Remove the layer of fat from the top of the water. Add the bay leaves, cardamom, sugar, and the onion. Cover and let it cook on medium heat for 45 minutes. Then add the salt, black pepper, and allspice. Let the meat continue to cook. It will take altogether about 1 1/2 hours to be tender. May or may not take longer depending on your meat. Once cooked, remove meat from broth. Strain the broth and set aside the liquid to use for cooking the rice. On a lined baking sheet, layer the eggplant and potato allowing room in between them. Brush each side with olive oil and a sprinkle of salt. Bake in the oven for 15-20 minutes then broil on high for 5-8 minutes till browned. Then drain and add the spices to it and mix together. Set aside. In a large pot, add a layer of rice. Then pile on the potatoes and eggplant equally on top. Then add another small layer of rice. Then add the pieces of meat. Then top it all of with the rest of the rice. Add the broth to the rice. Every cup of rice needs 1 1/2 cup of broth. Make sure the broth is covering the top of the rice completely with an inch to spare. Allow to come to a boil, then add a plate that fits the top of the pot and cover with a lid. Reduce heat to medium. Let this cook for about 45 minutes more or less. Just check on the rice to make sure it is cooked. Eat as is or flip the pot onto a large platter and slowly lift it up to have the effect of an upside rice dish. It may not hold its shape but that’s okay! Flavor is what matters. 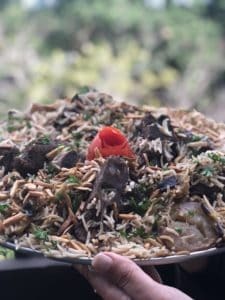 Garnish with parsley and toasted slivered almonds. Enjoy with a salad and plain yogurt.